Grabber Hand Warmers are trusted my millions of customers to keep hands warm!Grabber Instant Hand Warmers will keep your hands toasty warm in all weather conditions. Guaranteed to activate quickly for soothing warmth and comfort. Portable heat in the palm of your hand! 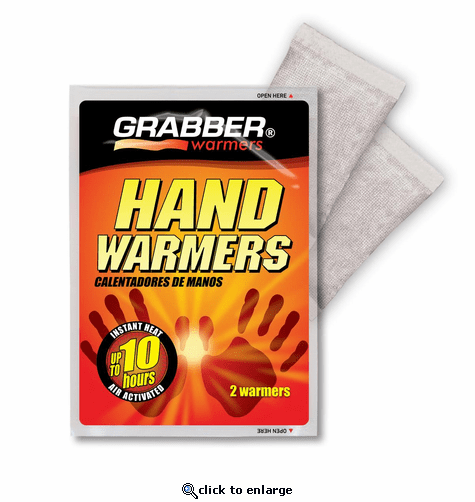 Air-activated Grabber Hand Warmers keep hands and fingers toasty for up to 10 hours. No shaking or kneading required; just open the package and put the "Original" Warmers in your glove or pocket for a few minutes to start the process. Contains 2 Warmers per Package! Lightweight pack keeps hands warm all day. 2 Pack weight: Only 1.7 oz.Hand Warmers are standard equipment for skiers, snowboarders, hunters, campers, hikers, birdwatchers or anyone who enjoys outdoor activities when the weather is cold. Hand Warmers are widely used as portable, long-lasting heat therapy. If you suffer from cold, sore hands and fingers as a result of Arthritis, Raynaud's, Lupus, Scleroderma, Sjogren's, Myalgia or just poor circulation, Grabber Warmers provide soothing warmth. They are fine by me. Serves it purpose for long or short walks. I love these hand warmers. I purchase them by the cases so that I will never run out!! I use them all year round. Wow, you never want to be caught in a hockey game without them! This brand is the best, you can find them anywhere but you definitely want to stock up with a case before the season starts, and have a couple extra for those long games! I bought this for my freeze baby family who visited and planned to walk around downtown during their visit. Prosgood for walking during winter..